I wrote about this offer back in early August, but it unfortunately sold out quickly. 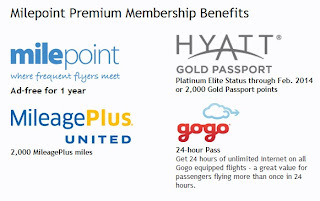 Milepoint, a frequent flyer community message board, is again offering premium memberships to their site for only $59. Premium memberships come with a host of benefits, including Hyatt Platinum Elite status. Platinum status comes with many great perks, including bonus points, free internet, late check-out, and preferred rooms. You also obtain the ability to status match to another hotel chain of your choice. Most programs, including Hilton among others, allow you to show proof of your status and be matched to a comparable elite level with their program. They do this in an attempt to woo heavy spenders and frequent travelers into their hotels. Luckily, they won't have any idea how you obtained your Hyatt status! 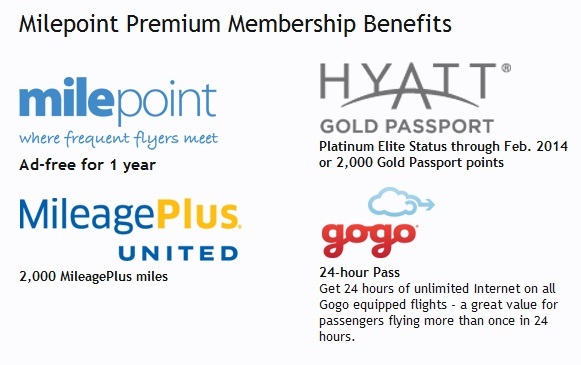 Hyatt Platinum status alone is worth $59 by itself, but there are tons of other goodies that come with Milepoint Premium memberships. 2,000 United miles, a free gogo Internet pass, and discounts on several great travel tools are just a few extras that come in this package. I didn't hesitate to pull the trigger on this, and you shouldn't either if you have travel plans in the next year. There are just too many great things included. If you have questions on the benefits or Milepoint in general, don't hesitate to email me or leave a comment.